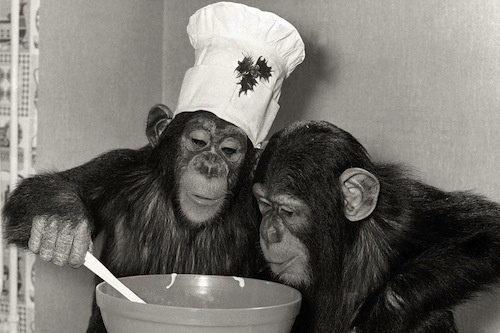 Can you teach a chimp to cook? Chimps probably won’t be whipping up souffles anytime soon. But there is evidence they might want to. Meet Alexandra Rosati and Felix Warneken of Harvard University. They’ve been conducting some intriguing food experiments with our hairier cousins. They fed chimps slices of both raw and cooked potato. When given a choice later, the chimps preferred the cooked food. Next the chimps watched a researcher put a raw potato slice into a lidded bowl and shake it. But before letting the chimp eat it, the human secretly swapped it for a cooked slice. Yum! When later the chimp was given a raw potato slice, she put it in the bowl! As though she wanted it to be cooked! The duo says the mental ability needed for cooking may be much older than we thought. The common ancestor of humans and chimps may have had it. Still, given Bonzo’s furry back? His grill station’s going to need a huge hair net!